Our micro needling services help revive your skin to make you look years younger. Contact us today to learn more. Micro Needling in Melbourne Fl. Introducing the Intensif, the most technologically advanced EndyMed Viera Florida(RF) Radio Frequency treatment therapy available today. The Intensif RF Micro needling provides the most effective skin remodeling, deep within the skin to revive and rejuvenate the natural production of new collagen, elastin and hyaluronic acid. Treatment with the Intensif RF microneedling handpiece triggers the skin’s natural healing process, rejuvenating and refreshing the skin while reducing the appearance of deep wrinkles with minimal discomfort and downtime. Wrinkles, acne, acne scars and stretch marks in all skin types leave you looking like a “better you.” The benefits are long lasting – with the Intensif RF Microneedling, your skin will continue to improve up to a year after your last treatment session! Why does our skin lose elasticity and start to sag and look crepy? Even with a healthy lifestyle and minimal sun exposure, our skin gradually loses its firm, youthful look. Aging, cumulative sun exposure, genetics and environment are all factors which affect the strength and elasticity of the collagen fibers in our skin. This, in turn, causes the wrinkles and sagging skin. Skin laxity can be improved by employing novel non-invasive energy-based technologies. Our experience has shown that when using the Intensif RF Microneedling technology, it is possible to tighten loose skin and promote production of new, healthier collagen, elastin and hyaluronic acid. 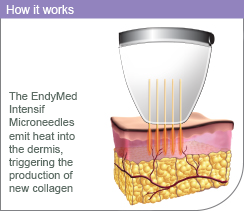 Radio frequency (RF) is an advanced technology that safely heats the collagen in the lower layer of the skin (dermis). If sufficient energy is delivered, the collagen will contract, providing an immediate change in skin appearance. The treatment also triggers a second process of new collagen production, leading to a significant change in skin appearance. A result of collagen, elastin and hyaluronic acid remodeling is tighter, younger looking skin. 2) it is not affected by skin color.